The physical format of the OMR CA Foundation application form is discontinued, with effect from June 2017. All student will be applying and submitting the form online only. The examination fees and bank charges will also be paid online henceforth. OMR Exam/Application form is prescribed format form to be filled while registering for CA Foundation examinations. In this article, you will know how to fill CA Foundation Exam form online, and all the details regarding CA Foundation application form/exam form. CA Foundation Application form is released on ICAI website on 20th February 2019, and the last date of submission of the Application form online will be till 16th March 2019. The student can still submit the Application form till 23rd March along with Late fees of Rs 600. The online submission of application will be closed at 5.30: PM on 23rd March 2019. Many students who have already filled the Application form for a single group and now want to apply again for both groups, leveraging the extra time granted for study, because of the shift in exams date can again apply through correction window opens from 27th March to2nd April 2019. 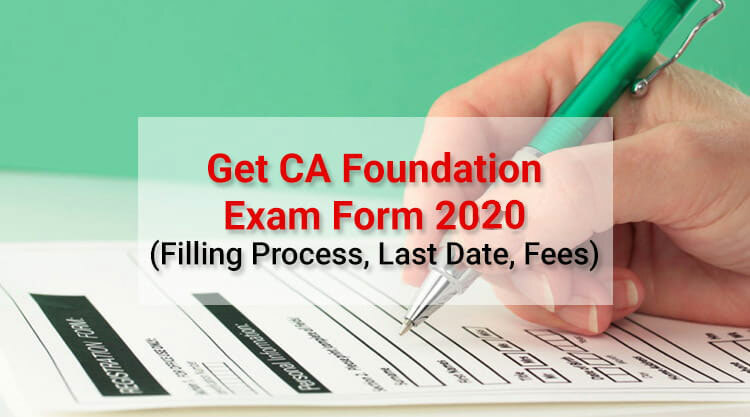 CA Foundation exam form last date for online submission for May 2019 exams falls on 12th March 2019 and CA Foundation May 2019 exams are being held on 4th, 7th, 9th, and 11th June 2019. For exams, held in November the last date falls in the month of August. Examination Form is free of cost at all the level. Examination Fees is also levied to the course. The table below shows the CA Examination fees for the Foundation. Pay examination fees through the card. Payment can also be made by using Internet banking facility along with bank charges applicable. After submission, a Pdf file will be generated which need to be saved in soft copy or hard copy, only if it has all correct details along with photograph and signature. If the form doesn’t contain scanned photograph and signature than exam form of CA Foundation is physically submitted along with photograph and signature, to the ICAI office. Give your proper and correct Email Id and phone no as the User id and password details are share on it. Use only your own Email id and don’t share your details with anyone. Fill the same details as mentioned in the Registration letter while filling the Exam/Application form, else.it won’t be accepted. Make all the necessary changes in details prior to applying for the examination. Do not fill more than one form at the same time on the same computer. Even if you are filling the two applications using different browsers or different tabs of the same browser it is beneficial to use another computer. Fill up the form, at a suitable time and from a location where you have a good bandwidth available using browsers Internet Explorer versions (9.0 onwards), Mozilla Firefox(5.0 onwards), Google Chrome(41.0 onwards) or Safari(3.4 onwards). Take a print out of the pdf file as a proof in case if you forget or don’t carry admit card to the examination hall. A photograph and signature are must to avoid hassles in obtaining admit card. Please upload scan copy or submit it manually with photograph and signature affixed. Students are requested to be handy with documents and details needed, before sitting to fill the CA foundation application form to avoid unnecessary delay.